Westpac Leading Index MoM has been released in Australia and the US will publish FOMC Economic Projections and Fed Interest Rate Decision. The support rests at 0.70500 with resistance at 0.71000 which the weekly pivot point at 0.70710 is located in between the lines. The EMA of 10 is moving with bearish bias in the ascendant channel and it is below the EMA of 200 and above the EMA of 100. The RSI is moving on the 50 level, the MACD line is below the signal line in the negative territory and the Stochastic is moving in low ranges. The ADX is not showing any clear signals. The price is in the Ichimoku Cloud and above the Chinkou Span. The Tenkan-sen and the Kijun-sen are both showing a horizontal trend. 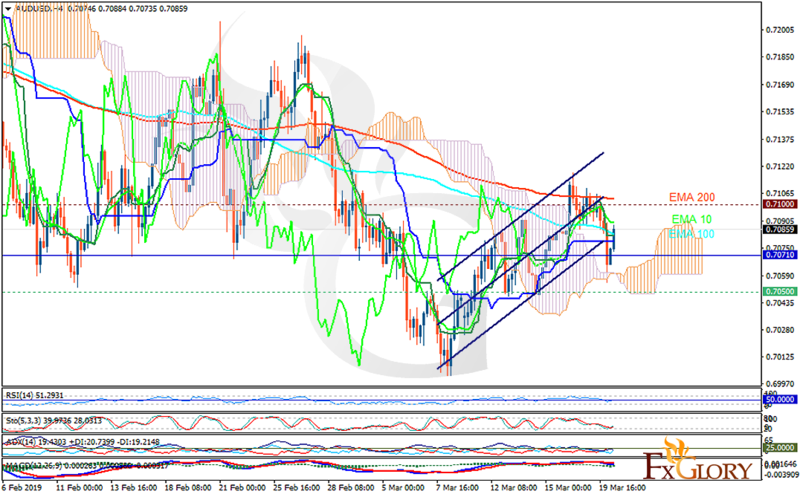 The support level breakthrough will smooth the way for further decline towards 0.7029; otherwise, AUDUSD may continue its bullish trend towards 0.71300.